We had the most wonderful time at Grandma and Grandpa Lund's - probably the best yet. Jaina took lots of naps. Ace is the best babysitter. Donald fished almost every day. Nothing better than Cranberry Lake. Family time at Grandma and Grandpa Z's cabin. Uncle Eric is building a house. Paul and Andrea, Victoria and John. Lunches at the Lazy Moose. Reminiscing at the "old cabin." First night spent with Great Grandma Lund. Ava and her prince John. Jaina loves to be outside! Another party for our favorite 3 year old. Thank you Grandma and Grandpa Lund for a wonderful vacation! We love you and miss you! We went to Montgomery today. I should have taken pictures. It was the First Saturday Market today and as we walked through the handful of tents selling various goodies, we could hear the old time country music drifting through the trees. Five old guys in cowboy boots and hats strumming electric guitars and playing the fiddle. Fantastic. The heat kept us moving and as we headed back to the car, we noticed a barber shop. Donald needed a haircut. I've been encouraging him to have someone else cut his hair because I don't enjoy the job at all. We walked up the ramp and pushed open the door. The room was filled with dead animals...everything from blow fish to turkeys to various 4 legged beasts. The barber was a large man wearing a huge smock type thing with large scissors and other hair cutting tools printed on it. On his head was a captains hat. The conversation he was having with his customer was intriguing... something about making religion a law and the government saying that religion and salvation are the same thing...then on to gun control...then to lawyers to make dumb laws...He did more talking than cutting it seemed. Donald's turn. He sat up in the chair and the first thing he said was, "I've been cutting hair for 44 years...after you do something that long it's just reflex." Hmmm...44 years ought to guarantee you a good haircut. Nope. As he went after Donald's head with the clippers he said, "Let me tell you something. If your doing something and it's hard to do, you don't know what you're doing." He doesn't know how close to home that was!! Ha! He was about done and I thought, "Surely he can't be finished!" So I suggested he shorten up the sides a bit...bad idea. The conversation turned to the violin hanging on the wall and I asked if he would play us a tune. As he took it down we notice the cord plugged into it. An electric violin? Yes, but the electric sound was being pumped out into the parking lot behind the shop. Ava danced as he serenaded the town for at least 10 minutes with 'not really in tune' "Puff the Magic Dragon" and "Amazing Grace." He was a cool old guy with lot's of personality and charm...some might say he was hilarious... definitely not they type of person you meet every day. :) $12, a bad haircut and more Texas culture than we needed for the day later, we left in search of someplace to eat. On a cooler day, we'd like to spend more time exploring all of the shops...there's some pretty interesting stuff. On the way home, I saw a sign that said, "Lake Forest Falls." In my mind I instantly pictured a lush green. mossy forest...a pristine river...and a mountain. Yep, a mountain. Oops...I forgot this isn't Oregon. I did a U-turn, hoping for something that I had pictured in my mind. Donald had his doubts. We drove down Old Highway 105 and there was a brown wooden sign that again said, "Lake Forest Falls." It seemed "woodsy" to me so I kept driving. Guess what it was. A subdivision. I will never be fooled again by signs that say things like "Canyon Falls" or "Cascade Spring." Uncle Lyle will be here in 34 days. 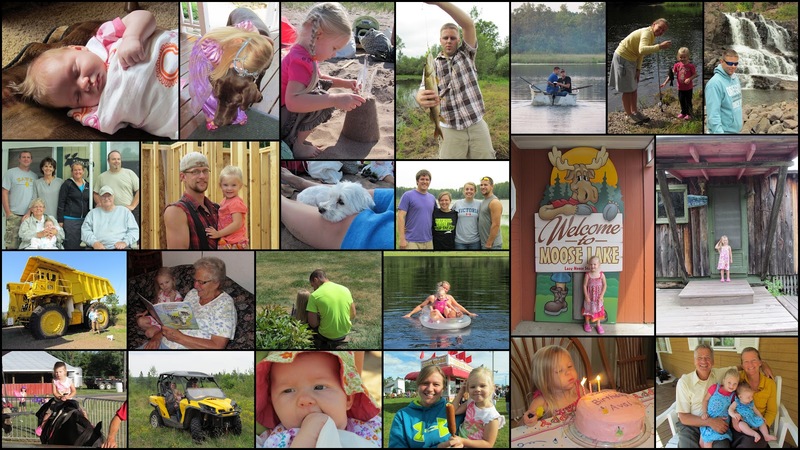 We have a few other special days in between...like Grandpa Lund's birthday, Daddy's birthday, driving to MN for vacation and Mommy's birthday. Lots to look forward to!